Kuwait: Vigor Events held its first Business Breakfast event in 2016 at Radisson Blu Hotel on the 14th of February. The Event, aptly titled “Leadership in Crisis” was developed to highlight the growing need for better Leadership in today’s economy. The event, which was attended by selected top leaders from various leading organizations in the country, discussed some of the biggest leadership challenges faced by organizations today and the effective solutions needed in this time of crisis. To speak at the event were 2 of this year’s Knowledge Club 2016 speakers – Graham Moore & John Mattone who addressed the issue head on. Graham Moore, independently validated in 2009 as being in the top 1% of facilitators globally for delivering Learning Effectiveness gave a presentation on the “Crisis of Leadership”. His topic stressed on Leadership Development being the #1 Business Need in Organizations. He further highlighted the need to have effective training programs that will enable leaders to grow and develop continuously. 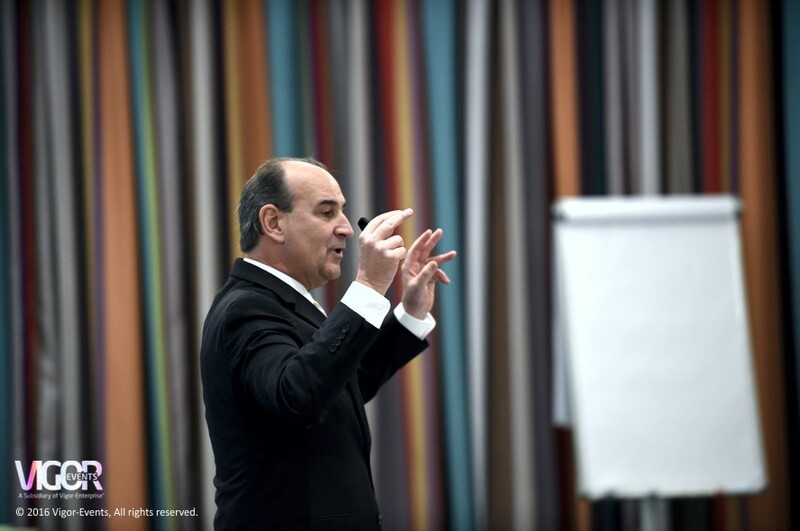 Considered one of the world’s leading authorities on Leadership & the executive coach to the late Steve Jobs – John Mattone – gave a presentation on “Disruptive Leadership in Disruptive times”. His topic delved into the importance of identifying high potential leaders as accurately and as early as possible using Apple Inc.’s “Think Different” campaign to showcase the need for leaders today to think differently and think big. During this highly unique and interesting event, Vigor events launched the Knowledge Club 2016 official calendar– the leading knowledge transfer platform that provides top companies and individual professionals in the region with an exceptional training and development experience. In its 4th edition, the Knowledge Club™ 2016 will be a combination of four enlightening 1-day seminars and four interactive 2-day workshops presented by the world’s most renowned speakers, authors, and trainers on the topic of “Leadership”.